If you’re looking for a Belly Pad for padwork and sparring, then the RevGear Bodyguard Belly Pad would deem as the perfect choice. The RevGear Bodyguard Belly Pad is constructed from 100% leather and padded with three layers of high performance RAM-Force™ technology padding for extra protection with an extra thick layer directly in front over your stomach. Formfit™ shape gives holder full range of upper and lower body motion, allowing them to check kicks and counter attack with kicks or punches. Sides are protected with an extra bulge padding for the holder’s safety. Fully adjustable exclusive Ultra-Lock™ hook and loop closure back strap fits any size. Flow through buckle with leather insert helps prevent skin irritation. Canvas inner lining hugs to holder’s body and cushions heavy blows. Sold as each. 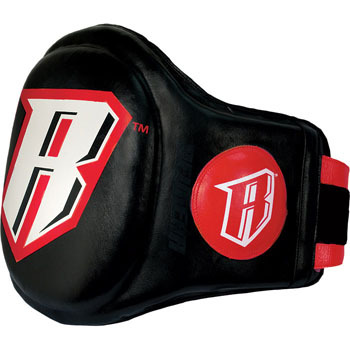 The RevGear Bodyguard Belly Pad is available at MMA Warehouse.